Preventative dental care can greatly enhance the life of your friend. Just like us, pets have teeth that are meant to last a lifetime. >> Peridontal disease occurs in both cats and dogs. As tarter builds up on the surface of the teeth, it may lead to showering of bacteria throughout the body having an effect on organs such as the heart. 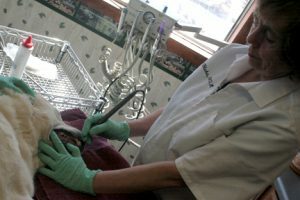 Yearly dental exams can help improve overall health care and give our pets the best chance at a longer, healthier life. >> Dental radiographs are often used to reveal disease that can occur under the gum line including complications with the tooth root or reabsorption of the jaw bone. Root canals and tooth restorations are additional options offered to provide full dental care right here without having to see a specialist. After hours emergency services available. 2017 Boulder Veterinary Clinic Powered by Medics WordPress Theme.